↑ Paul Gottfried, Conservatism in America: Making Sense of the American Right, p. 9, "Postwar conservatives set about creating their own synthesis of free-market capitalism, Christian morality, and the global struggle against Communism." (2009); Gottfried, Theologies and moral concern (1995) p. 12. ↑ Hill, Kennneth L. (2012). An Essential Guide To American Politics And The American Political System. AuthorHouse. प॰ 172. ↑ १०.० १०.१ Miller, William J. (2013). 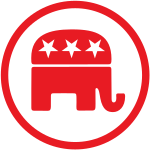 The 2012 Nomination and the Future of the Republican Party. Lexington Books. प॰ 39. ↑ Schneider, Gregory (2003). Conservatism in America Since 1930: A Reader. NYU Press. प॰ 387.